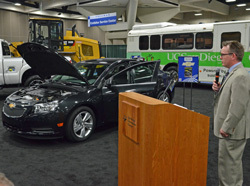 The Vehicle Showcase drew many with a vested interest in what’s new in biodiesel fleets. General Motors showcased their new 2014 Chevy Cruze Clean Turbo Diesel, the first light duty passenger car in the U.S. to be fully approved for use with B20 biodiesel blends nationwide. The 2014 Chevy Cruze Clean Turbo Diesel was the winner of the biodiesel industry’s coveted Innovation Award for 2014. Chevrolet/GM’s Chris Farmer is the Manager of After Sales for Chevrolet Southern California and spoke on behalf of their showcased vehicle taking attendees through each of the car’s specs.